Brilliant, poetic, a master of fantastic symbolism and emotional portraiture, John Crowley is one of the finest contemporary American novelists. As Harold Bloom writes in his Preface to this book, "Crowley writes so magnificently that only a handful of living writers can equal him as a stylist . . . Of novelists, only Philip Roth consistently writes on Crowley's level." Engine Summer; Little, Big; Aegypt; Great Work of Time; The Translator: these are only the highlights of a twenty-five year literary career of extraordinary depth and eloquence. 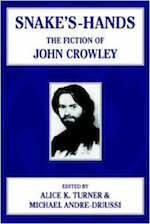 Yet Crowley has not been the subject of a full-length critical study until now; Snake's-Hands remedies this lack, in full. In Snake's-Hands, Alice K. Turner and Michael Andre-Driussi assemble a host of brilliant essays on the fiction of John Crowley, by such eminent writers and critics as John Clute, Thomas M. Disch, James Hynes, Brian Attebery, and Bill Sheehan. Explore with them Crowley's fantasticated retellings of the Hundred Years' War and of innumerable beast fables; his subtle rendering of the bucolic decline of Earth; his astonishing, multi-leveled vision of the fairylands deep within mundane reality; his British Empire upon which the sun, heartbreakingly, never can set; his glowing, brooding trio of Hermetic masterpieces; his tale of poetry at war with nuclear annihilation. Wonders of artistry, the artistry of wonder: Crowley is a genius, and Snake's-Hands demonstrates this alluringly, in a potent mosaic of insights. Snake's-Hands: The Fiction of John Crowley is the essential guide to the work of a great writer, and a landmark of criticism in its own right.